Catalan President Carles Puigdemont delivers a speech at the memorial of "Fossar de la Pedrera" (Pedrera mass grave) in Barcelona, Spain, October 15, 2017. MADRID - Catalan leader Carles Puigdemont on Sunday called for calm less than 24 hours ahead of a deadline from Spain’s central government for him to clarify whether he has declared independence for Catalonia or not. 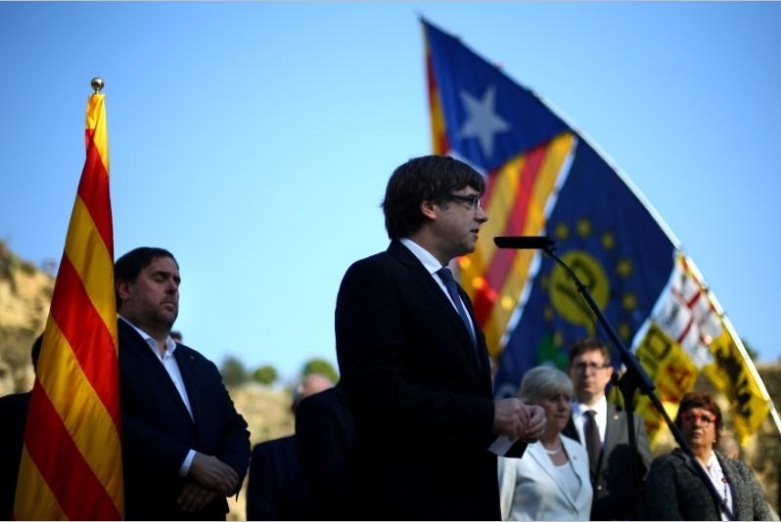 “The (Catalan) Government and I want to reiterate our commitment to peace, civility and serenity, and also to (...) democracy as inspiring the decisions we have to make,” Puigdemont said during at a memorial event at Barcelona’s Montjuic cemetery. Though Puigdemont did not indicate how he would reply to Madrid, public Catalan TV broadcaster TV-3 said he would not give a “yes” or “no” answer, but a more elaborate response. The Spanish government has said it will take control of Catalonia if Puigdemont give an ambiguous reply. “The answer must be without any ambiguity. He must say ‘yes’ or ‘no’,” Spanish Interior Minister Juan Ignacio Zoido told Cope radio on Saturday. The Catalan government says 90 percent of Catalans voted for a breakaway in an Oct. 1 referendum that central authorities in Madrid declared illegal and most opponents of independence boycotted, reducing turnout to around 43 percent. Under Article 155 of the Spanish constitution, the central government can suspend the political autonomy of a region if it breaks the law. This article, which enables Rajoy to sack the Catalan government and call a regional election, has not been activated since the constitution was adopted in 1978 after the death of dictator Francisco Franco. Spanish newspaper El Mundo reported on Sunday that if article 155 was invoked, the government would replace the Catalan government with a new set-up to manage the region autonomously, which could be run by politicians or technocrats. Within three months, elections would be held. Catalan leader Carles Puigdemont on Sunday called for calm less than 24 hours ahead of a deadline from Spain’s central government for him to clarify whether he has declared independence for Catalonia or not.